In the conclusion to this series of posts about an uncooperative research subject, she shares a bit about the data collected during this episode of field research. 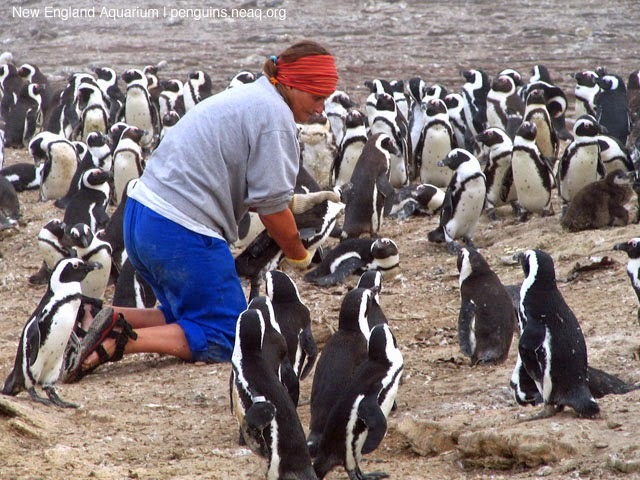 Catch up by reading previous posts: Part 1, Part 2, Part 3, Part 4 and Part 5 about one particularly difficult attempt to study African penguins in the wild. Epilogue: despite the sleepless nights our penguin caused us, she did provide us with valuable information. After we equipped her on February 23, 2009, she left the island at 7:40 am and headed in a north-westerly direction. She only arrived back at the colony 62 hours later, at 9:40 pm on Wednesday February 25, just before the device’s battery went flat. During the time she spent at sea, she travelled 184 km and ventured as far as 58 km from the island. This is quite an unusually long foraging trip compared to the other 53 foraging trips we recorded at Halifax Island so far, although trip lengths and distance covered can be highly variable. While at sea, our penguin dived 1479 times, or 24 times per hour. Her maximum dive depth was 71.2 m, not the deepest dive we have recorded so far, but still respectable. Catching a logger penguin: crawling into the colony to catch a penguin wearing a logger. Food appeared to be scarce around Halifax Island at the time, with chick condition generally poor and large numbers of chick mortalities due to starvation noticed all over the island. The data we collected that summer showed that the penguins at Halifax Island were working harder than usual to feed their chicks. This is precisely the type of information we need in order to find ways to improve the tenuous conservation status of African penguins in Namibia. The information emanating from our project has been instrumental in defining the shape and size of Namibia’s first Marine Protected Area, the Namibian Islands’ Marine Protected Area (NIMPA), which includes Halifax Island and the surrounding waters. Our project continues to play a vital role in monitoring and evaluating the NIMPA’s effectiveness and I look forward to Katta’s visit next February. Want to see penguins in person? Visit the Aquarium! It's the summer of Penguinology right now, so not only will you be able to observe more than 80 penguins, you'll be able to learn the most wild and surprising facts about these beloved birds. Here's where to start planning your visit.